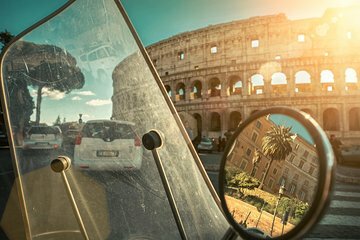 Explore Rome in classic style with a full-day scooter rental that includes a 3-hour, guided tour of the Colosseum, Palatine Hill, and the Roman Forum. Zip through the city on a 50cc scooter, stopping to see and experience the things that interest you most. You have the option to choose a morning or afternoon Colosseum tour for maximum flexibility while touring Italy’s Eternal City. Make your way to a pickup location in central Rome, where your scooter will be available starting at 9am. Create your own itinerary for seeing Rome, whether that means visiting every gelato shop you see, stopping to explore historic landmarks, or just immersing yourself in the city’s colorful street life. The morning and afternoon tours of the Colosseum depart at 10am and 1pm; when it’s time for the tour, simply meet a guide onsite. You’ll learn the history of the Colosseum from gladiators to emperors and games, walking through the first tier, arena, and second tier. Following the tour, you’ll have the rest of the day to keep seeing the city by scooter, then make your way back to the original departure point by 6pm. Please note: A minimum of two people are required for booking this tour, and one scooter is provided for each pair.